Duncan, BC (Oct. 5, 2016) – The best women curlers in the province will be heading to Duncan this season, Curl BC has announced. 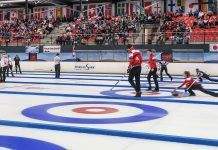 The 2017 Scotties BC Women’s Curling Championship, Presented by Best Western, will take place at the Glen Harper Curling Centre, home of the Duncan Curling Club, from January 17-22. The final four games of the event will be televised on Shaw TV. The event will showcase BC’s top women curlers who will be playing for the opportunity to represent the province at the national Scotties Tournament of Hearts in St Catharines, Ontario. The format of the event is an 8-team round-robin, with a four-team page playoff. One berth is allocated to the returning champion and one berth is allocated to the Canadian Team Ranking System (CTRS) points winners (the BC women’s team with the highest ranking on the CTRS list). There will be two open events to decide the remaining berths, one in Vernon and one in Abbotsford. Three teams will qualify at the first event and three teams will qualify at the second. The Glen Harper Curling Centre, home of the Duncan Curling Club, is a five-sheet facility in the Cowichan Valley.